For over 30 years, the Alpha has been the first choice for millions of model rocket modelers. Easy to build, rugged performance, parachute recovery - the perfect rocket to get you started! This educational bulk pack offers substantial savings over buying the rockets individually. Retail $129.99 SAVE 22% ! Have been building the Alpha with my class for many years. Great rocket for the novice builder. Looks and flies great. The Alpha is just one of those iconic rockets. We bought the 12 pack to share with our friends as it greatly reduces the price per rocket. We also built a few ourselves. The Alpha continues to be one of our straightest flying and stable rockets. It has a very wide motor range with a good flight on an A8-3 (perfect for small fields), a great flight on a B6-4, to an out of sight flight on a C6-5 (you may not get this one back). The box comes with 12 rocket kits, plus a bag of spare parts. The 12 chute seems a bit too large. We made our own 8 parachute and it comes down faster without any damage so far. Fun rocket to build and fly. Great for kids and adults. Easy to build and fly. "Alpha rocket for junior high summer camp"
This classic design with parachute recovery is always the most popular at my camps. As usual, patience is needed when gluing the fins. When a model rocket has been sold to millions of model rocketeers for over three decades, there has to be a reason. With its high quality components, easy assembly and reliable performance, the Estes Alpha has become the all time leading entry level model rocket! With a rocket this well known you are bound to get compliments from fellow rocketeers on choosing such a thoroughbred. 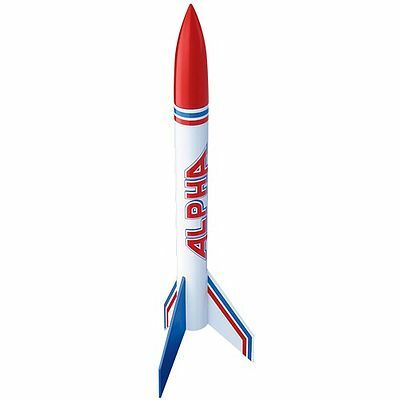 The Alpha is a classic Skill Level 1 rocket kit that includes a one piece body tube, laser cut balsa fins and an aerodynamic nose cone that completes the sleek look. Building this speed merchant takes about an afternoon and flying is just as easy and enjoyable as building this classic. When powered with a C-class rocket engine, the rocket can reach cloud topping altitudes of 1,000 feet (305 m). Recovery of this aerodynamic wonder is accomplished with a colorful 12 inch (30 cm) preassembled parachute. Its suggested color scheme and classy red, white and blue decals are as American as you can get. You'll feel patriotic building this sleek and colorful rocket as well as flying it. Get an Alpha and start flying today!